All right, I admit it, I can’t get enough of Megan Auman and her business products. No, it’s not just because we have the same name. She tells it like it is and really helps business owners (like you and me) learn the monetary and marketing side of their craft. I’m thrilled to share with you another of her wonderful mini-workshop (this one with videos!) that focuses on the big bad wolf of your creative business: PRICING! Claim to Fame: Business blogger extraordinaire of Crafting an MBA and owner of Megan Auman jewelry. Password-protected page where you can view and submit questions! First off, Megan Auman hits it out of the ballpark with this mini-workshop! All of us STRUGGLE with pricing because everything seems either too high or too low but nothing feels right. Or, our ‘right’ price makes us feel like only millionaires could buy our gorgeous stuff. Megan helps you adjust your thinking by showing you why profit is NECESSARY, why formulas are only a starting point for your prices (remember materials + hourly rate + labor = wholesale x 2 = retail? yeah, forget that! ), and why you CAN sell your product at the price you want. What makes Megan’s series unique? I’m all about the worksheets and so is Megan! She gives you 8 detailed sheets to fill in with all of your lovely numbers. Time to start crunching overhead costs, how much you should pay yourself per hour (that’s right, it’s time to start paying yourself for the gorgeous work you do! ), and how much profit you need to make in a year to grow your business. She balances all of this math (math is only fun for so long) with great affirmations about the VALUE of your work. Remember, people don’t buy based on formulas. They buy because of the benefits your piece gives them and the value it conveys. If you convey the value of your piece effectively, you can command as high a price as you like. Just look at the cost of a sports car! You can’t even fit a week’s worth of groceries in it and yet people drop thousands on them! By far I squealed the most over the password-protected Q & A section. Megan took the time to answer every single pricing question I had (and I had a few!). It’s so helpful to get a different perspective on pricing and what better perspective than from an artist making a living from their work? If you’re like me and you’ve felt so torn over what to charge because A)you don’t want to lose customers and crash your business but B)you’re making no money or have no time for yourself because of your business, you should look at this mini-workshop. I got my hands on it a few months back and since then I’ve doubled my prices. That’s right, I doubled them! And you know what…I’ve nearly doubled my profit. Never in a million years did I think people would pay the prices I put down, but they did and I’m thinking of doubling prices again come the end of the year. 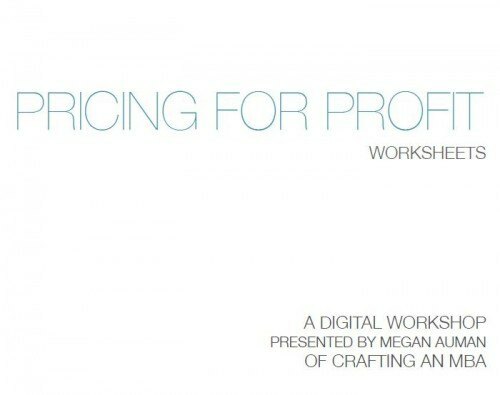 So, please, do yourself and your business a favor and check out Megan Auman’s Pricing for Profit.